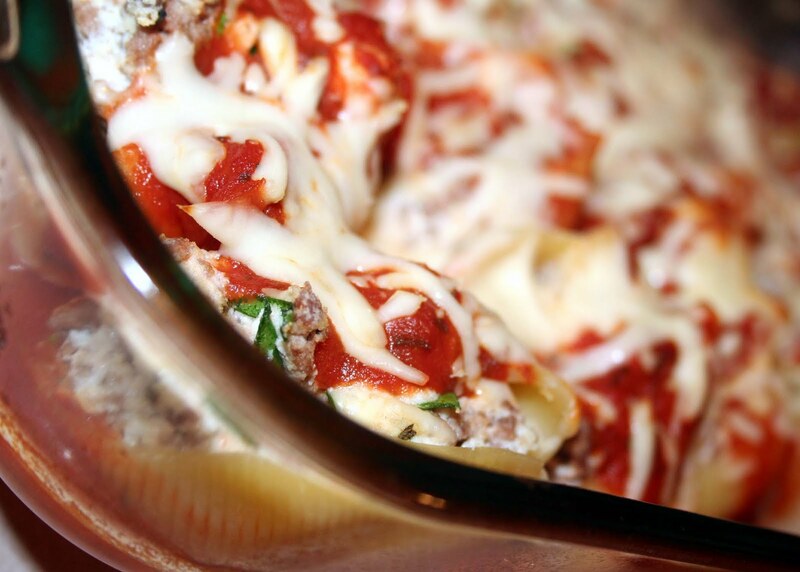 Stuffed Shells are a recipe that while time consuming, always rewarding to eat. I love to make stuffed pastas on the weekends and freeze them to heat up later, or for within a few days when I know I'll be busy. Plus, they're PERFECT for new parents, an injured friend, new neighbors, etc. I personally like meat in my stuffed pastas, but there are so many great stuffed shells recipes out there that cheese pastas would be fantastic as well for a make-ahead meal. You just can't go wrong with comfort food that's ready to go! Bring a large pot of salted water to a boil. Cook the pasta shells according to the instructions on the package. Drain, rinse in cold water, and set aside. Heat olive oil in a large skillet on medium high heat. Add the onions and cook until softened, about 5 minutes. Add the meat to the pan, breaking up into smaller bits. Cook until cooked through, and no pink remains. Add the garlic and cook until fragrant, about 30 seconds to a minute more. Remove pan from heat. Beat the egg lightly in a large bowl. Mix in the ricotta, chopped spinach, 1/2 cup of the Parmesan cheese, basil, bread crumbs, salt, pepper, and meat mixture. Fill each cooked pasta shell with some of the ricotta, spinach, sausage mixture. Spread 1/2 cup tomato sauce over the bottom of each of a 9 x 13" baking dish. Arrange the stuffed pasta shells in the dish. Spread the remaining sauce over the top of the pasta shells. Top with desired amount of mozzarella cheese. Justin, what is the purpose of using my photo? As long as it's not a negative post and you send me the link that would be OK I guess. Does this recipe make one or two 9x13 pans? Just wondering because your recipe uses only half the box of shells and Simply Recipe's uses a full box. Thanks!